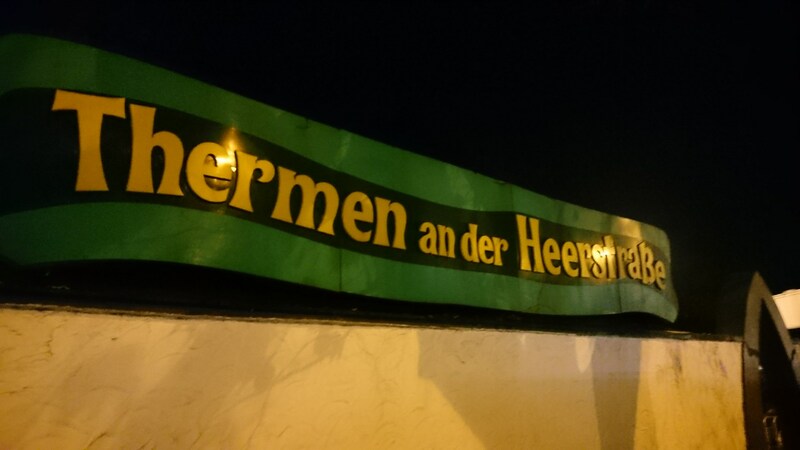 An institution with the charm of the old West Berlin of the 1970s with a moderate entrance fee and rather mature regular visitors, although I have seen some younger people there as well. 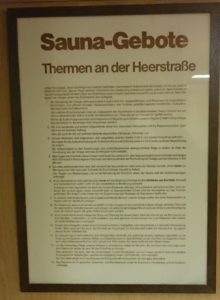 Swimwear is undesirable according to the sauna rules (yes, you also use basins naked) and there is no separation between men and women, neither in the sauna, nor in the dressing room or in the showers. The atmosphere was overall very relaxed and had a family atmosphere as the whole facilityis not very large. If you are looking for a modern, chic sauna, this is definitely not the place for you. It is noticeable that no major modernizations have taken place for a long time. However, the available equipment not dingy – just old. 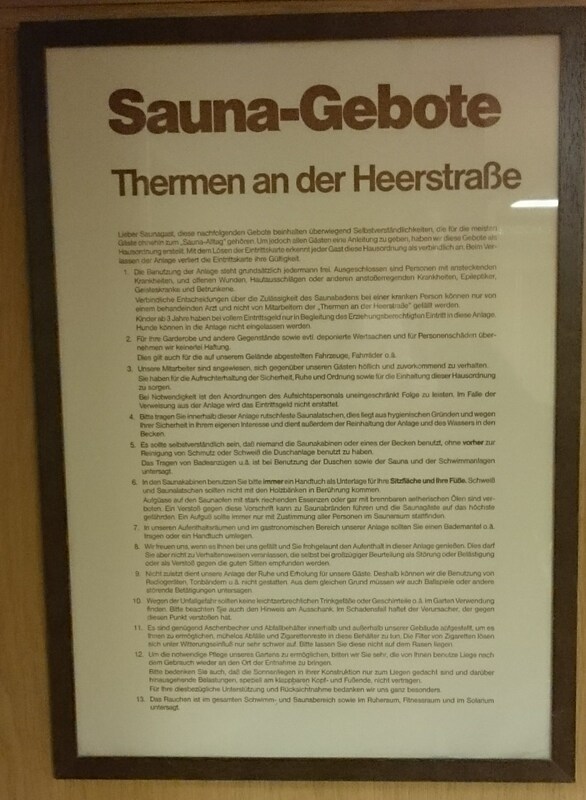 On the other hand you have three saunas at 90°C, 100°C and 110°C. You can also make an infusion in the last one (yes, you do it yourself – as it should be in a proper sauna), three thermal pools at 19°C, 30°C and 42°C and a protected outdoor area with large basin (so no problems bathing naked there – nobody will see you except the other visitors). The latter was a bit too cold for me at a temperature of just about 10°C outside. I also did not try the rest room with sun loungers as the seats outside were fine for me as well. There also many showers, both warm and cold. If you want to, you can also let cold water be dropped from a wooden trough on the wall, which is then replenished automatically. The gastronomy in the evening was limited to the “grill area”, since the restaurant is not open regularly due to the lack of demand. The offered food and drinks are quite simple (but good quality) and vegans have bad luck here. But if you ask you can get at least things without meat. There are various types of beer, water, fruit juices and a changing menu with lard, goulash soup, blood and liver sausage with potatoes and sauerkraut, fried potatoes with meatloaf and eggs or even just eggs, sausage salad with fried potatoes, stew with goose and noodles with vegetables. Very pleasant: the payment is done at the end, when you leave the facility. But when you ask, the friendly ladies there can tell you any time how much you already have consumed. While eating fried potatoes and having a beer I had the opportunity to talk to one of the regular visitors who is already a pensioner. She told me that the thermal baths already had been there in the early 1960s. Before the Berlin wall came down it was also a quite favorite place among West Berlin celebrities. Also the restaurant was quite full these days. Quotation: “You had to stand in three rows in front of the bar and it was also not important, who was a celebrity or not – we were all just in towels and bathrobes”. As I have also learned, Sunday is the day where more occasional visitors come along, mostly young men from Africa and Morocco. Wednesday evening there is usually a group of Russian men who love to drink alcohol before, during and after the sauna, as I have also experienced on this evening (it was in no way disturbing or harassing). 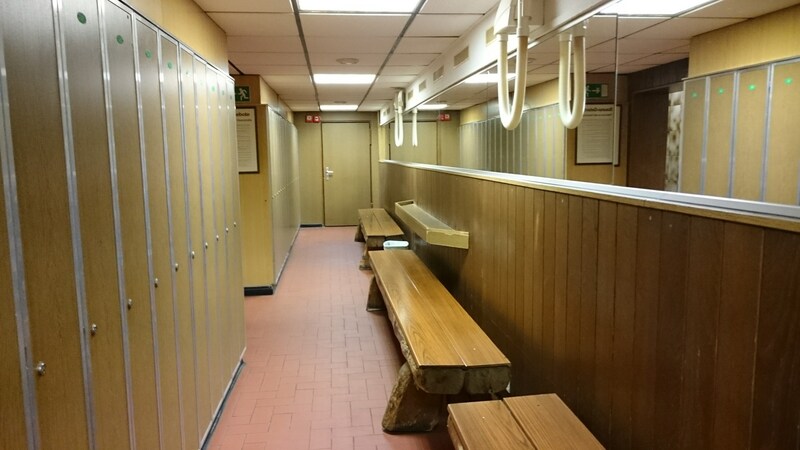 One a day of the week there is also a pure women’s sauna in the morning, whereby I do not remember exactly whether it was Saturday or Sunday – in case of doubt ask there because it is not indicated on the website. I will probably go there more often in the future.